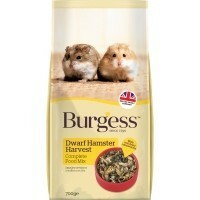 Burgess Dwarf Hamster Harvest Complete Food is a hamsterific luxury meal created especially for your pet Dwarf hamsters. They're omnivores, so as well as cereals, vegetables and nuts they need meat too – in the wild, they eat grubs and insects. That's why Dwarf Hamster Harvest is a complete food, which combines the finest quality natural ingredients of whole dried mealworms, seeds, hearty grains, delicate wheat flakes and wholesome peas, with the optimum balance of nutrients. Also, to suit a Dwarf hamster's smaller mouth it has small ingredients they'll love to crunch. My dwarf Hamsters truly adore this food,and they all are thriving on it. The only food my two, very old, dwarf hamsters will/can eat! Small pieces with lots of variety! I give this to my Russian Dwarf hamsters, alongside another food. They LOVE it and it is specifically tailored for the needs of dwarf species so I know it's good for them. Excellent stuff.